For Haddonfield’s Peter G. Gould, giving back to your community is one of the most important and selfless things a person can do. Being in a position to give back, Gould wanted to help the community’s youth. For his extraordinary commitment to educating North Philadelphia’s children, Gould was chosen as a recipient of the Gesu School Spirit Medal, an award given by Gesu for those dedicated to the school and to the success of its students. Gould will receive the award on May 5 at Gesu School’s annual gala. “The Gesu School has been a part of (my wife and my) lives since we moved to Haddonfield and the area 20 years ago. It’s very flattering to recognize me for what I have done there, alongside those who have received the award over time. It is a great honor, particularly from this great organization I’m devoted to,” Gould said. Gesu School is an independent Catholic, Jesuit school serving 450 mostly non-Catholic children in grades pre-K through eight located in North Philadelphia, and is recognized as a national model for inner-city education. The school strives to provide a quality, innovative education for its neighbor children to empower them to break the cycle of poverty and violence. Gould feels giving back is something everyone has an obligation to do. He believes no one becomes successful without help and that you have a lot of debt to repay. He felt one of the best ways for him to give back was to do so through the Gesu School. A member of Gesu’s Board of Directors since 1997, Gould has served the school in many capacities. He and his wife, Robin Potter, have endowed two scholarships for Gesu School and support four Sponsor a Child scholarships through their family foundation. Gould leads the Assessment and Measurement Committee to support curriculum improvements and development by measuring long-term academic performance and document Gesu’s ability to instill critical “soft skills” — such as grit, self-control and resilience. “We’re trying to take a leadership position, as we are recognized for it, and are documenting how we do it to make it replicable to use in Gesu School and other schools,” Gould said. The Gesu Spirit Medal honors individuals who have shown extraordinary commitment to Gesu School, through their loyal advocacy and actions, and who have made a significant contribution to Gesu School’s success as a model inner-city elementary school. Gould embodies all of these characteristics. However, Gould is very humble about receiving the award. He feels the award isn’t about him or what he has done, but what can be done for the youth. “What people have to realize is supporting the education of a young person can have enormous positive consequences for them and the people they touch in their lives … We may never know the ultimate outcome of what we invested in them, but if we’re able to (support them) in education, in the rearview mirror of life that is a very good thing to have done … I want to encourage other people to do so as well,” Gould said. 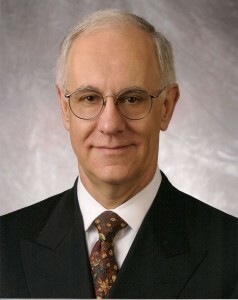 Gould is a former turnaround investor and corporate CEO who has transitioned into academia and non-profit management. Today, he works as an adjunct professor at the American University of Rome and the University of Pennsylvania. In addition to Gesu School’s board, Gould also serves on several nonprofit boards, including the Zoological Society of Philadelphia, the Academy of Vocal Arts, the Sustainable Preservation Initiative and the University of Pennsylvania Museum of Archaeology and Anthropology. “When I’m not working on teaching or writing, I’m involved in the boards. I don’t have a lot of free time,” Gould said with a laugh. The Gesu Gala is Gesu School’s annual fundraiser, which supports its mission to empower North Philadelphia’s children to break the cycle of poverty and violence through a quality education. To learn more about the award and Gesu School, visit www.gesuschool.org.